The development of Russia’s own launch site is essential as Kazakhstan continues to drive a hard bargain on Baikonur. The Proton 2 rocket crash on July 2 and the breakdown of relations with Kazakhstan, where Russia held a 50-year lease for the use of the Baikonur Cosmodrome, have led officials to once again start talking about the Vostochny Cosmodrome, which is being built close to the Chinese border in the Russian Far East. The location of the supercomplex, which has cost more than $10 billion, was not chosen by accident. It was once the home of the formidable Satan and Topol rockets. The facility was closed down in 1996, with missile silos being destroyed and a number of military personnel reassigned to more peaceful missions. The mobile platforms were equipped with the newly reconfigured Start rocket, whose mission was now space exploration, rather than military combat, and a number of satellites were launched. Thus was the short-lived history of the Svobodny mini-cosmodrome. Things changed in 2007, when a super construction project – the Vostochny Cosmodrome – was ordered on the site by presidential decree.The country’s leaders had decided that Russia needed its own launch site, independent of any other country. The Plesetsk Cosmodrome in the north and the launch sites for the converted rockets from the Urals and the Volga region (Kapustin Yar) were insufficient, apparently incapable of handling the load. Meanwhile, manned and heavy Proton launches, only took place in Kazakhstan. In addition to the $115 million annual lease, the owners of the Baikonur Cosmodrome levy huge fines for any accidents and pollution. Russia also pays for the social costs associated with the city. So the financial arguments for building a Russia-owned launch site are no less compelling. The project also has a socio-demographic purpose, as experts – including highly qualified specialists – will be required to put the site into operation and then keep it running. At present, there are 3000 construction workers engaged in the project, with as many as 15,000 to be involved in total. Some 25,000 people will work at the space port once it is fully operational; a town for 100,000 people is currently being built not far from the complex (35,000 people after the first stage of construction)! Launch of the new Soyuz 2 will take place from the Vostochny Cosmodrome in two years’ time, and cosmonauts will be sent to the International Space Station three years after that. The Angara modular missile is also being prepared for launch (interplanetary launches are scheduled to commence in 2015). Meanwhile, there is talk of competition between Russian designers vying to win a tender to build a rocket capable of taking a 75-tonne load into space (or even more than 100 tonnes)! 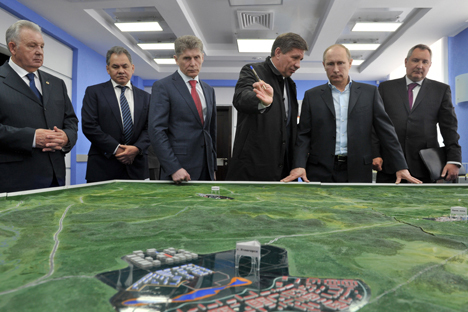 Inspecting the cosmodrome this spring, President Putin noted that the new site will be far more effective than the existing one in a number of ways. But we shouldn’t forget that it was only two years ago that then Prime Minister Putin was criticising Roscosmos for delaying construction. After all, the competition is hot on Russia’s heels, and we need to launch new rockets in time. Otherwise, the Vostochny Cosmodrome will serve very little purpose.